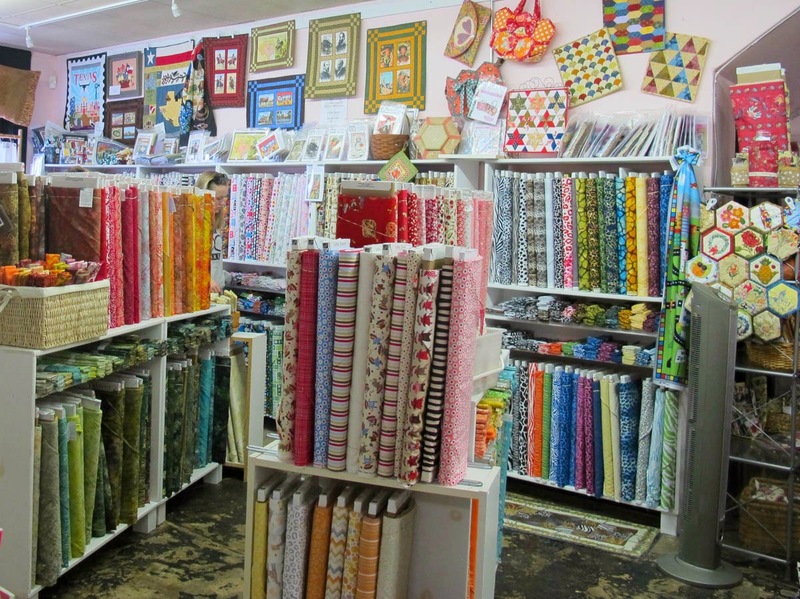 Deep in the Heart of Texas, McKinney, TX, that is, there's a special get happy place just for quilters. 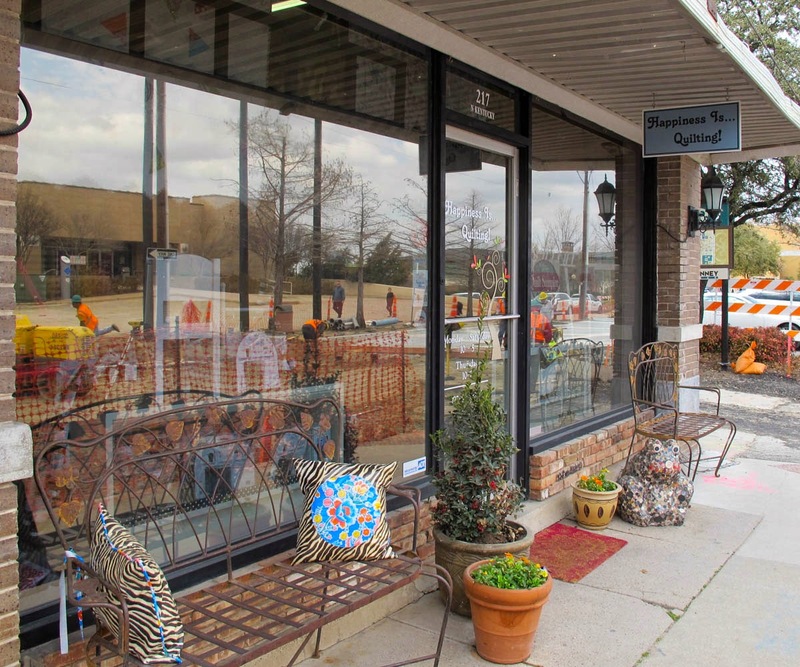 A great fit for this charming and historical town just 30 miles north of Dallas, the shop is housed in a building that dates back to 1898. Unfortunately I had a tough time getting a photo of the shop exterior due to all the street construction going on out front. 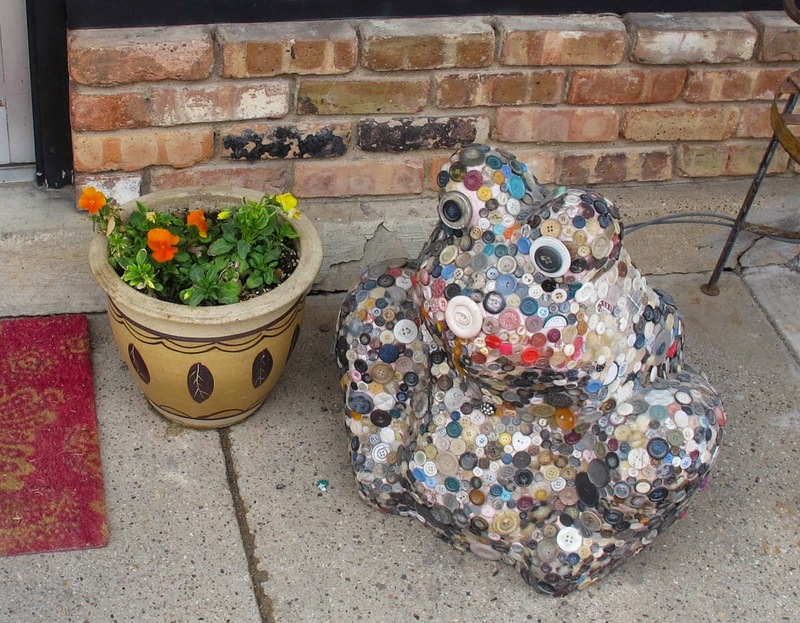 But you can't miss the unique giant frog adorned with a gazillion buttons! He'll have you entering the shop with a smile on your face. You immediately notice the high old fashioned tin ceilings and the pink walls adorned with quilts and wall hangings. No lack of ideas for your next project here! 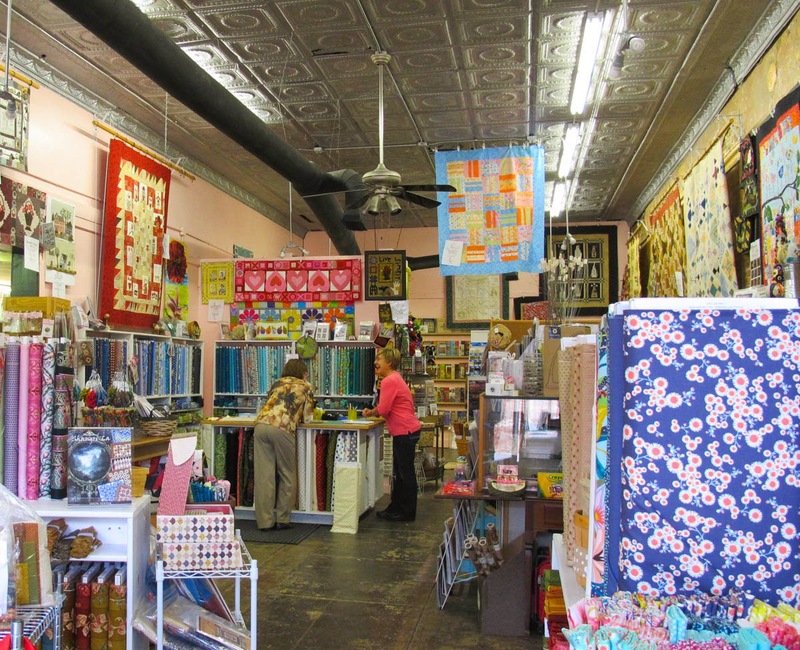 Shop owner Laura Kay Houser is passionate about her quilting and handwork and it shows. 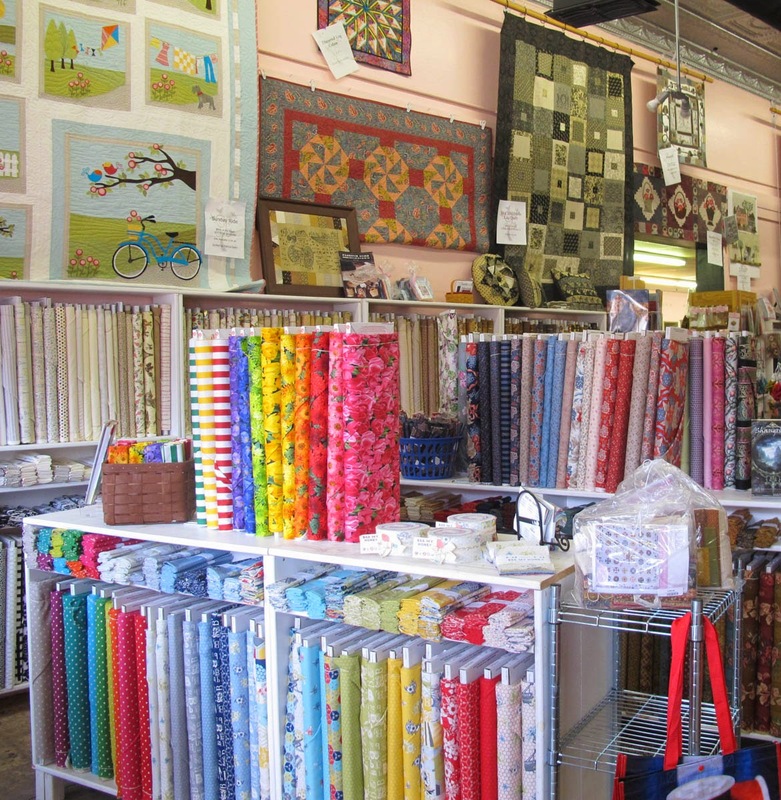 The selection of fabrics is very diverse, and includes brights, civil war, batiks, 30's, novelties, Westerns (this is Texas, after all! ), 1800's reproductions and more. 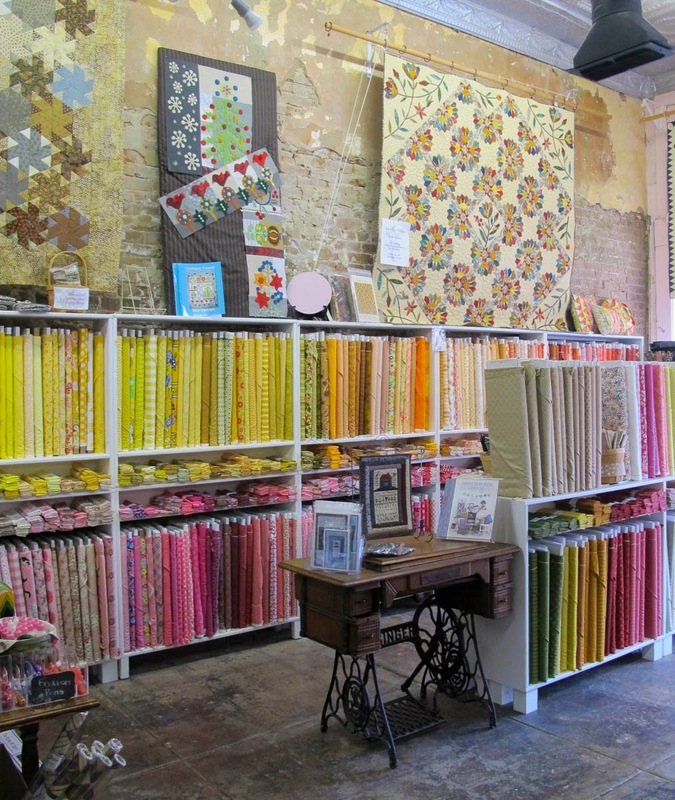 There are wools, flannels, and even oilcloth and reproduction Dutch chintz fabrics Laura imports from Amsterdam. Notice the beautiful quilt on the wall at the upper right. It was gorgeous. And the old Singer treadle machine used for display. A number of antiques throughout the shop added to its charm. The shop's expansion into the adjacent building a few years ago provided space not only for more merchandise but for the many classes offered throughout the year. In addition to talented local teachers, Laura brings in experts such as Harriet Hargrave, Pepper Cory, Sally Collins, and Carol Doak. So check out her class schedule and plan a relaxing getaway to learn new skills and take advantage of McKinney's numerous and unique places to stay, dine, shop, and just generally have a good time. Soft and pretty flannels for baby quilts and more along this wall. I always appreciate fat quarter nooks accompanying the shelves of bolts. So quick and handy. embroidery. There were also many giftable items displayed everywhere in the store. 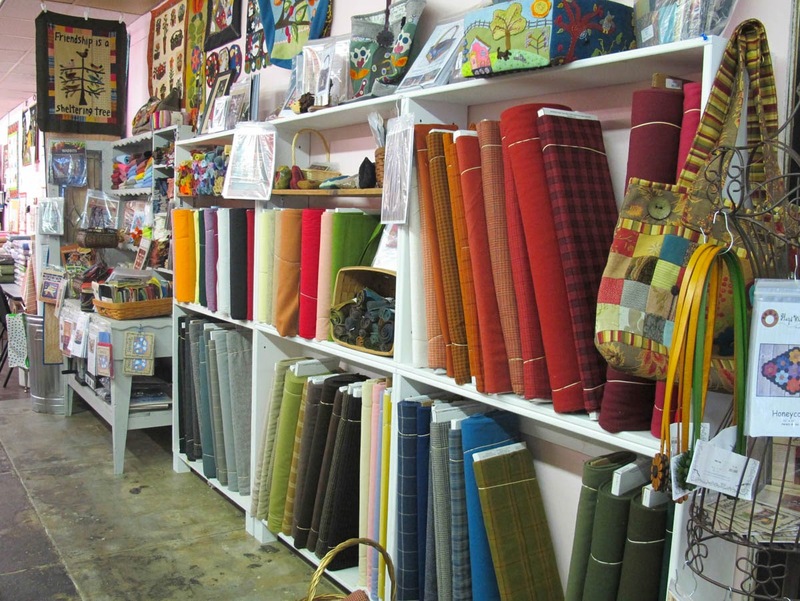 The area of the shop devoted to wools and wool felt. Lots of patterns to utilize them too. To the left there is also a selection of lush flannels. If you enjoy handwork using these types of fabrics, this is a plus for the shop. These fabrics can be hard to find in Texas. 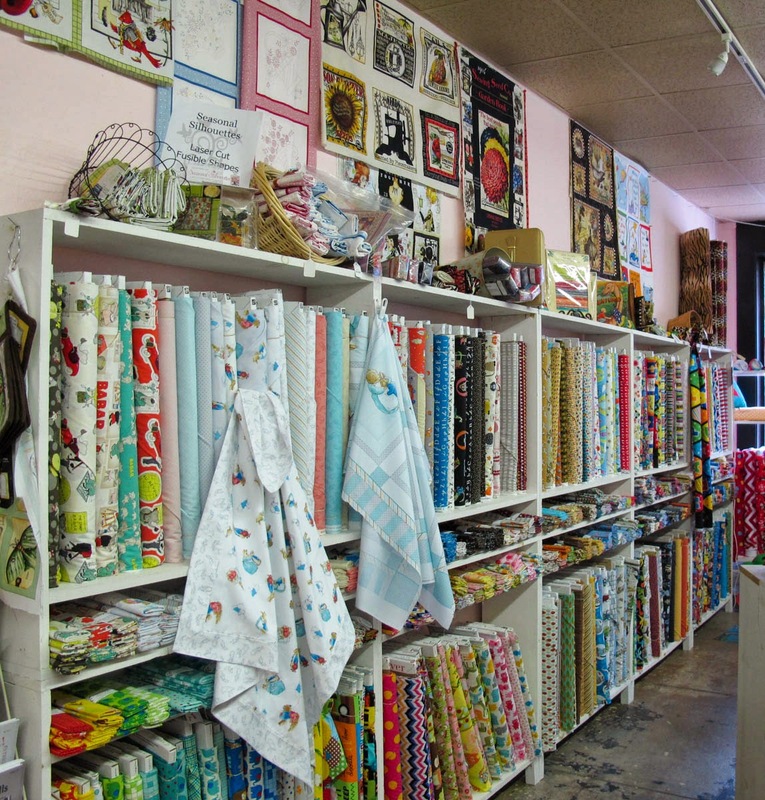 This room was a gold mine for threads, threads, and more threads. Here is where I spent most of my time and money. 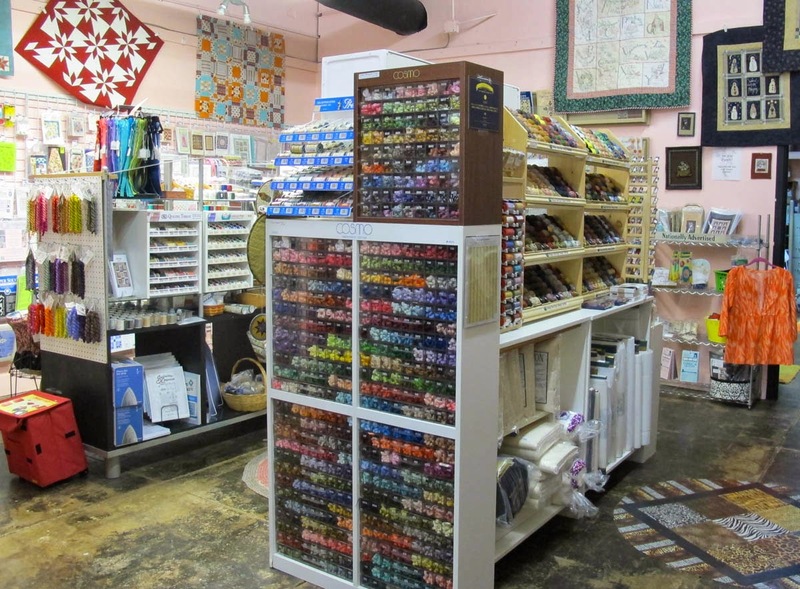 We had visited the shop's booth at the Dallas Quilt show and discovered that they had a larger selection of threads and wools available in the shop itself. Since McKinney isn't that far from Dallas and I was going to be in the area for awhile, we decided on a day trip to McKinney. It was worth the drive. 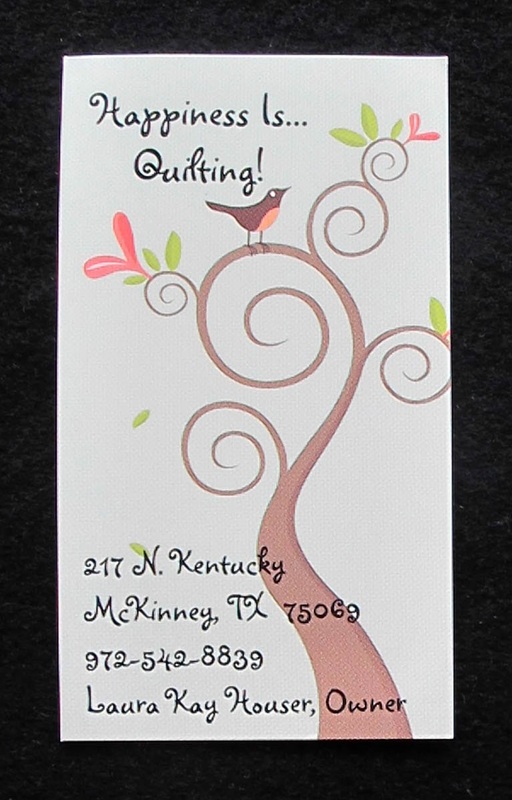 The shop's business card. Stop in if you get the chance, otherwise you can always visit them on the web at happinessisquilting.com. 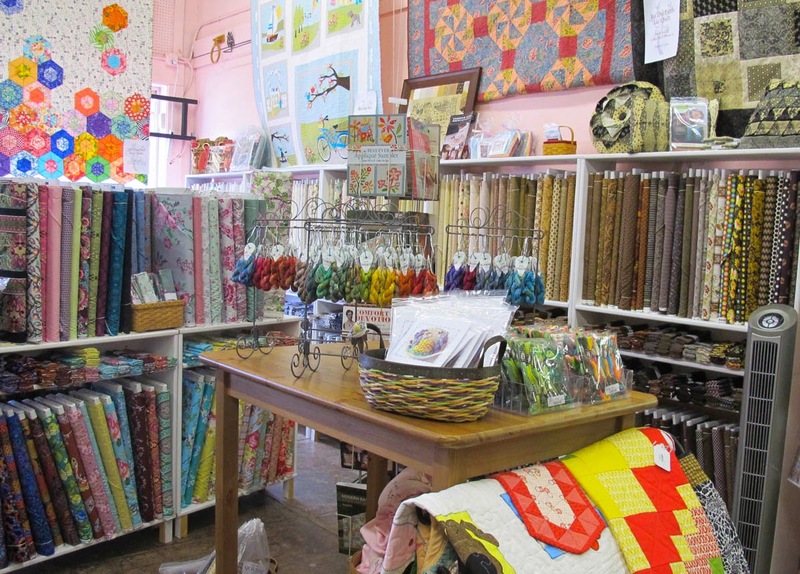 Also, if you can find the Fall/Winter 2011 issue of Quilt Sampler magazine, there is an excellent write-up on the shop. Happy Quilting everyone!